Katy Dalys is the ideal pub to go to if you want a nice quiet drink. The staff are great craic, the music is always good and there is always some sort of entertainment on. The vast array of drinks are on offer(27 whiskies alone!) and the wide variety of entertainment means there is something for everyone. A warm welcome is guaranteed. 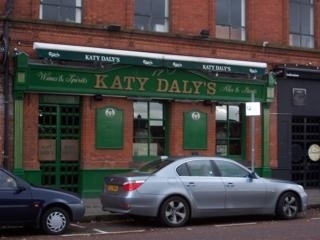 Katy Dalys bar, situated on Ormeau Avenue, just 5 minutes from the city centre, offers a casual and relaxing atmosphere. Have you got Google Earth on your computer? If so, then download the Google Earth view of Katy Dalys. Is this the wrong position for Katy Dalys? If you think so, then modify its position. Click / Tap the button above to get directions from where you are to Katy Dalys. waited 10 minutes at the bar trying to get the attention of a man right in front of me, he then pointed at a sign and said, "no service here, theres a sign RIGHT THERE!" I prefer going here just for a quick pint before heading to gig in spring and airbrake, as otherwise it can be really boring. The staff are also very rude and unwelcoming. I've never seen one of them smile.They have no people skills.I was really mortified as i had friends over from abroad and they even commented on the rudeness of the staff. shame really. Nice pub and lovely decor but check beforehand if attending any events!! We'd checked all pub events on for a Monday evening in Belfast (limited I know)- we had family from london staying and fancied the quiz advertised. We arrived at 9pm as per online notice and had to wait till 10:30 before the quiz master decided not to have the quiz!! not only that but a drinks promotion was advertised just before the quiz was due to take place and remained on the wall even though there was no promotion as there was no quiz!! at least the barman felt my disappointment and gave me the bacon fries for free - Very disappointed - the quizmaster totally ignored those who bothered to turn up - should have went to the Empire!! I don't know how some have come to the conclusion that this bar is expensive or overly grubby? Katy Dailys is not amazing nor is it rubbish. It is a student bar first and foremost (but not solely a student bar), catering primarily to the more rock/Indie music orientated punter (you'll not find a cool FM DJ guesting in here Thank fck). One criticism I would have is that some of the clientèle can be a bit carried away with themselves and therefore lack respect for others in the bar (it's not uncool to be polite and friendly to the people around you)but apart from that I would not have a problem with the place. This has got to be the worst bar in Belfast. Poor ambience, expensive drinks, no entertainment, ignorant staff.....The list is endless. I almost expected a tumbleweed to come rolling through the bar it was that quiet! -1/10...no make that -2! Pretty grubby place. Poor ambience and surly rude bouncers/staff. A Great Bar. Plenty of Atmosphere and the pub quiz on a Monday night is out of this world. The only pub quiz where I've ever seen 67 teams on average. An all round great pub and very handy for heading to the Limelight or the Spring and Airbrake afterwards as they are on either side.